ActualPlay.net – No more failing the "Spot Hidden" roll when searching for a new tabletop RPG actual play. There are few new tricks in role playing games, the question is how can you take that old trope and make it fresh? CSI: Neverwinter takes the heroes from another place/time trope and does its own wild spin on things. 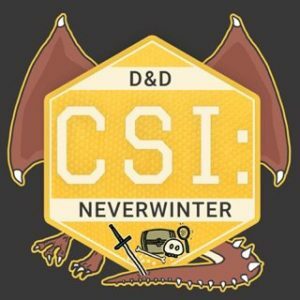 CSI: Neverwinter begins with beat cop, an undercover cop, and a DA who get taken across the dimensional divide between Earth and Toril. They are given new bodies in order work at the direction of a shady “other” power and try to stop crime and be heroes along the way. DM Scott Bignhefte is crafty, zany, occasionally vulgar, but most of all original and clearly enjoys DM’ing. This is not some feel-good processing of emotions or a quasi-parable of the problems of modern America, it is a fun and irreverent band of out-of-plane adventurers behaving in the ways players with heroic superpowers actually behave. They don’t always follow the plot clearly laid out for them, they act in ways that are a bit darker than you might want heroes to, but you can see the whole time the DM working to direct the story. Kudos, Scott. Now into its second season, the players are GM are definitely better at the rules of D&D. It does start out rough, as can be expected in an actual play that contains people playing a game that has as much history and mechanics as D&D for the first time, or the first time in a long time. Not only that, but the sound quality is a bit poor at first, but is notably better later on in season 1. So keep listening if those things are what bother you in the first episode or two. The plot is fun, with mystery and hijinks—and complete absurdity. While CSI: Neverwinter may sound like a more serious series, it occasionally veers into Scooby-Doo level antics—just with more violence…. a lot more violence. The NPC’s are as zany as the players, and Droop the Goblin is priceless as the “secretary” for our CSI team. I shouldn’t love Droop, but I do. So, if you’re looking for crime-solving antics with a bit of the weird and extra-dimensional taking place in a familiar location in the Forgotten Realms, this fun D&D Actual Play is well worth checking out! NSFW, Explicit tag in iTunes. Photo from the podcast feed for CSI: Neverwinter and all rights reside with the original creator. Chris and Matt Ing must’ve looked at the back of the Starter Box of Fantasy Flight’s Star Wars: Edge of the Empire and laughed. Three to five players, haha, two is enough. While some pregenerated FFGStar Wars adventures are balanced, this system is pretty flexible and doesn’t inherently require defined roles in the same way as, say, Dungeons and Dragons 4e. Any difficulties are dealt with by the addition of an ensemble NPC crew. That crew accompanies protagonist Kan Click Kachak, “Click,” a Chadra Fan pod-racer of some renown, as he travels the galaxy scrounging, bumbling, and developing a heroic side on his way through Imperial-controlled space. So, with brother Chris as GM and brother Matt controlling Click and directing the NPC crew members, they produce a fast-moving, smart, love-letter to Star Wars in the form of an actual play podcast. Season One operated under the rules of Edge of the Empire, while the brothers are now exploring the other variations, Age of Rebellion in season 2 and Force and Destiny in their patreon-only recordings. These systems, while essentially the same, have different mechanisms to drive the plot in a direction more in keeping with certain kind of atmosphere. In Season One Click is driven by the constant threat of everything falling apart, debts being called on, or bounty hunters catching up. As the first season developed other elements of Star Wars lore crept in, as well as a developing animosity towards the Empire and not just various elements of the underworld. The story evolved in compelling way, yet from a perspective not often taken—literally “from below” in the form of these silhouette zero characters. In some ways this allows Silhouette Zero to offer comedy-laced commentary on the order of the Star Wars Universe. Also notable is how well the brothers play off one another, their lifelong relationship results in such banter that you even forget there is just two of them. A good reminder to GM’s… get to know your players. Silhouette Zero is a reference to the main conceit of the podcast (what I’ve heard Chris and Matt refer to as a gimmick, but I’ll give them more credit than that!). In FFG’s Star Wars system, silhouette zero characters are the smallest size player characters. They are the Jawas, Chadra Fan, Droids, and other such smaller races—and Click and the other player-directed NPC’s are these tiny people. It is both cute, and serious—dealing with some dark elements of human existence by using these easy to overlook smaller characters. Chris and Matt do such a good job at a two-player version of Star Wars: Edge of the Empire I have to wonder why FFG hasn’t reached out to Chris and said help us make this work. It would certainly grow the hobby. I see this as a perfectly valid play-style, as can be seen in Gumshoe one-two-one’s like Robin D. Laws’ Cthulhu Confidential. It might be that player-plus-droid is an awesome way to enjoy FFG Star Wars with only two people—we certainly see Luke play Star Wars like that with R2-D2. These bite-size adventures are great, most recordings are well less than an hour, and it is quite possibly the best bang-for-your-buck Star Wars Actual Play out there: your time will be rewarded. High quality audio, sound effects, music (including some singing of familiar motifs). No language or content issues. 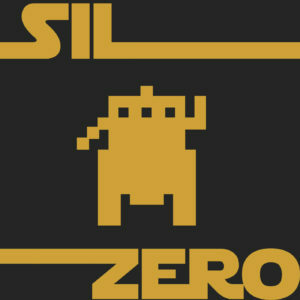 Photo from the podcast feed for Silhouette Zero and all rights reside with the original creator. Burning Wheel is the kind of system that people hear a lot about but might feel intimidated to run. While there are a number of great actual plays the one that seems closest to my own experience with the system is the continuing drama of the Sunday Skypers Burning Beards actual play. Adroitly GM’ed by Wilhelm Norsten, this is an actual play that rarely sits more than a few days unplayed in my podcast app. With 50 episodes (and still going), it starts at character creation and then shows the kind of deep character development that the Burning Wheel system is really designed for. The series started with an affable and accessible setting and character creation session. Character creation is supremely important in Burning Wheel. The character stocks (Men, Elves, Dwarves, and Orcs in the basic Burning Wheel Gold) are quite distinct, and the Sunday Skypers chose Dwarves. This decision turns out to be genius as it results in the creation of characters informed by tropes about dwarves, but free from too much baggage brought in from other systems. It also means that character creation is as much about the system itself as the player’s particular desires for some kind of outcome from the system. Dwarven Greed and the implications that come from that help drive both the creation of the characters, and their eventual drama later on. At 50 episodes, the characters have journeyed deep into the lost dwarven stronghold of Scoria Deep and had success and disaster come their way. Ghosts, Dragons, family history, and much great beer (every party should have a brewer) keep the listener engaged. Returning plot elements show that both the players and the GM aren’t just trudging back into this setting one more time for each recording, but truly seem to enjoy it. The plot is expansive enough to allow for guest players to join in, but not too broad that you feel like they are telling another story. There is one unfolding story, a heroic journey to recover family wealth and territory, but because it is Burning Wheel this unfolds rooted at the level of individual character’s beliefs, instincts and traits (BITs). In Burning Wheel every session has to end with awarding various points to players for their fulfillment of BITs, internal conflict, goals, and roles. If you are ever wondering how to do this, and that is likely every new GM and Player of Burning Wheel, please listen to the end of the episodes. It might seem like the time to stop as the narrative has stopped, but theses ending minutes are really valuable to understand what is going on inside the characters and not just their actions. The players and GM will discus the BITs, but also offer feedback and critique on them. Sometimes a belief is simply unusable in game play and needs to be changed! This makes a good podcast like Sunday Skypers extremely useful. The system and the story are equally discussed, and their self-criticism is honest and leads to a better narrative and role play experience in the end. 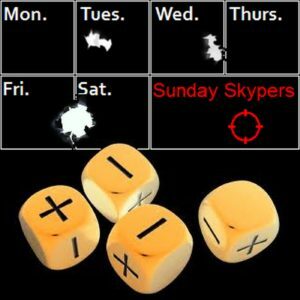 So, if you are looking for a high-quality podcast covering Burning Wheel or would simply like a well-GM’ed adventure story, take the time to check out The Sunday Skypers Burning Beards. Explicit tag in iTunes, occasional overtalk. Photo from the podcast feed for Sunday Skypers and all rights reside with the original creator. This David Crennen GM’ed triumphant stumble through Star Wars parts the blast doors of reality with no regrets—heck, it might knock them off entirely. It is occasionally drunken, raucous, vulgar, absurd, and little screwed up in all the right ways. This is one of the earliest Fantasy Flight Star Wars actual plays and reveals the kind of zany storytelling enabled by the FFG narrative dice. 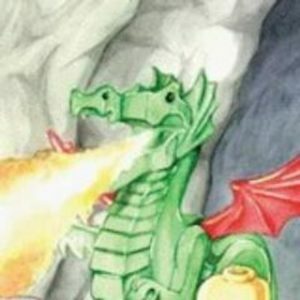 Similar to Saving Throw‘s other long-running Actual Play, Crit Juice, you can support the players or GM through twitch and purchase rerolls and similar game benefits. Multiple story-arcs have seen homicidal droids, ill-fated Alderaanian superlaser engineers, delusional Ewoks with Rancor pets, and numerous other beloved(?) characters wreak havoc across the galaxy. The player characters, almost all played by comedians, are well-embodied, highlighting their intentional personality quirks (defects?). That being said, there is one reoccurring character who deserves explicit mention, and is a particular favorite of mine, and yet I hate the character with a passion, Gippy Bindoo. Gippy is a morbidly obese Mon Calamari diplomat from Dac. This character flowed through much of the series. A seemingly invincible, completely reprehensible, uncannily lucky, vile and morally bankrupt fish-man with more than 9 lives, who will either endear you to player Andrew W. Jones, or make you wonder what kind of twisted person invents such a character. The NPC’s are just as creative and bizarre, including a decidedly unpresidential Hutt, but as these writeups are meant to be spoiler-free, I’ll say no more. The website for the game also has some resources if players would like to incorporate some of the elements from NTMTO, but most of it is from the early seasons. It also has some helpful guidance for new players to the system, including a bonus tutorial episode for new players. This game, despite its comedic tone, is a great starting place to learn the Fantasy Flight narrative dice mechanics. You can fail with a triumph or succeed with a despair, and all the while the narrative evolves. Crennen, as his other GM’ing credits testify, is very talented at keeping the story going even with sponsored re-rolls and intoxication creating more chaos than just a surprise despair roll. GM’s who might be intimidated by the narrative dice system will find a great example of adaptive storytelling in NTMTO. What is truly amazing is that Crennen and crew make this Actual Play feel like Star Wars, and that is really the highest compliment I can offer. Seasonal, on break. Roughly weekly release schedule when active. Explicit tag in iTunes, and it deserves it. Occasional overtalk and table noise. 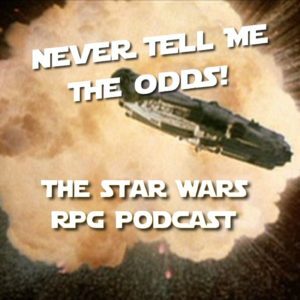 Photo from the podcast feed for Never Tell Me the Odds and all rights reside with the original creator. There are very few Actual Plays that make me happy simply because they exist, but knowing that there is an active and well-prepared AD&D 2e Spelljammer campaign is one of them. Masterfully DM’ed by AuldDragon, this brings to life one of the most original Dungeons and Dragons settings every to see print. If you have heard it said that AD&D 2e is unbalanced, too nitpicky, too dated, or too whatever and you should simply move on to 5e, then please watch these recordings. 2e is a robust roleplaying system and in AuldDragon’s hands it shows itself to be a capable system for engaging storytelling and adventure. Many distinctive elements (nonweapon proficiencies, Thac0, weapon speeds), are well-handled and presented in such a way as to not interrupt the flow of the adventure. Sometimes a player might get some rules mangled with another edition, but you won’t find the kind of derision towards certain mechanics (Thac0 requiring simple math or roll-low for nonweapon proficiencies) that is encountered in some Actual Plays of 2e by players who began their roleplaying with newer editions. This is not an Actual Play of a museum piece, but an Actual play that reveals that 2e is still a vital game system. AuldDragon’s Spelljammer campaign will introduce newer viewers to Spelljamming Helms and the strangeness of the phlogiston and hopefully inspire them to delve into the rich back catalog of Spelljammer titles on DriveThruRPG. For those of us who remembered playing this setting when it was new, it will remind us that we now live in an era when we can play any game we want with modern technology, we aren’t limited by what is available on the shelves of our FLGS. AuldDragon’s preparation shows, his integration of Roll20 into the stream helps players and viewers track with movement and combat in space. Being one of the few settings in 2e that expected hexes and squares to be used at the table (boxed sets and the Spelljammer DM Screen all shipped with little flats), viewers will find it very convenient to keep their bearings during both space and personal combat. There aren’t the elements one finds in more produced Actual Plays, no rich soundboard, live studio, multiple camera angles, and professional audio from all players, but what one will find is a welcoming table to join and watch. AuldDragon GM’s a virtual table that makes the Spelljammer setting shine in Actual Play (and not just something hoarded by collectors on Ebay). 4 hour recording length (broken into 1 hour chapters on YouTube). Rare vulgar language, occasional audio interruptions, occasional audio quality issues, occasional technical difficulties, over talking. No RSS feed. Artwork from AuldDragon’s twitter profile and all rights reside with the original creator. The Innsmouth House Players were the first group to put Actual Play recordings on the internet1 and their back catalog contains an impressive array from the greatest Call of Cthulhu scenarios. One of the lesser known ones is the mind-bending Unseen Masters. YSDC‘s Innsmouth House Players brought decades of experience together at the gaming table in their final Chaosium-produced campaign. Their final commercially-available campaign is their recently completed recording of Cubicle 7’s Curse of Nineveh. The exceptional Keeper, Val Robertson, excelled at keeping this three story-arc campaign taut and disconcerting. The unrelenting series of events wore down the sanity of the investigators as all good Call of Cthulhu scenarios do (even making the listener wonder just what evil was causing things to unravel… what unknowable force is warping the world of the investigators?). The table banter is remarkably self-aware, completely versed in the tropes of Lovecraft and of the other classic Call of Cthulhu scenarios. Paul Maclean‘s characters are a delight to listen to unravel and meet their end, especially as they are often insufferable. Graham Bissell’s character Damien Sunderland (a descendent of a previous campaign’s character) is well-played throughout, a good example to listeners who might wonder how to play a modern, level-headed and technologically literate character in Call of Cthulhu. Val capably contains the impacts of technology, a possible help for keepers who wonder how to run these “modern” scenarios written before the ubiquity of the smartphone. Unseen Masters lacked the globe trotting scope of Masks of Nyarlathotep and Horror on the Orient Express (both available as recordings from YSDC), but it succeeded in a kind of creeping fear that will make you want to know “how is this madness going to end?” The conclusion will reward the listener for their patience in sticking with the winding plot. Worth noting is that in 2001 Bruce Ballon won the Mary Seeman Award for Achievement in the Area of Psychiatry and the Humanities from the University of Toronto for Unseen Masters—so you have award-winning madness on display in this recording! The Innsmouth House Players never got bogged down in Unseen Masters with things like torturous accounting rolls that occasionally endanger forward narrative development in Call of Cthulhu— a nightmare that happened in YSDC’s recording of Beyond the Mountains of Madness as they reviewed manifests in preparation for their journey to Antarctica. Val kept the investigators on the trail of the terror, and when time came for the horror to unfold, she was absolutely masterful. The YSDC Actual Plays were once limited to supporters of YSDC, but are now publicly available on the website. Sign up and check them out. Picture from Yog-Sothoth.com showing part of Helen Maclean’s “Julie Hayward” character sheet, all rights reside with the original creator. This Stu Venable (@srvenable) GM’ed Traveller podcast used the Mongoose Traveller 2nd Edition rules and remains one of the few examples of MgT2e Actual Play. As a bonus, Happy Jacks included the recording of Session 0 for those who want to see the infamous and occasionally fatal character creation system for Traveller at work. 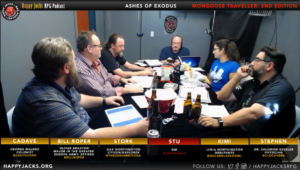 Ashes of Exodus is the second Happy Jacks Traveller release, and instead of utilizing an existing setting GM Stu created a compelling Tech Level 10 setting with clear limits to technological development (Tech Level 10 is just entering into the Faster than Light era). Frontier challenges, Politics and intrigue run deep in this believable hard sci-fi setting. Session 0/character creation shows some of the give-and-take needed to develop a setting that is compelling to both GM and players. As this Actual Play was only released for 5 sessions, regardless it remains commendable because of the ruleset, the character and setting creation, and the table dynamics. A notable aspect of this recording is that it reveals the diversity of the characters as produced by the Traveller system. Kimi (@goldenlassogirl) generates a Debutante—with the power of wealth and connections (and not much else); another player character takes a detour into jail. Characters in Traveller already tell a story when you finally set out to play them, and this is one of the few Traveller Actual Plays to reveal that essential aspect of Traveller. The Happy Jacks table is always fast and conversational, not always orderly, but almost always entertaining. The wits are sharp and the years of roleplaying experience are invaluable—and that unique table synthesis is apparent in this recording. Update from the Happy Jacks Twitter feed, this setting will return in February 2018. Irregular release, currently on indefinite hiatus. Good quality recording, occasional overtalking, explicit tag in iTunes. Picture from the Happy Jacks YouTube recording and all rights reside with the original creator..
Arguably the most popular Actual Play out there, the Matthew Mercer DM’ed phenomenon rightly deserves the attention and awards it has received. The key players, all exceptionally talented members of the voice acting community, created dynamic and evolving characters throughout the series run from low-levels all the way to the jaw-dropping conclusion of their run at the verge (or actually reaching) of level 20. This series is commendable for several reasons. First, for its quality as entertainment within a developing media. 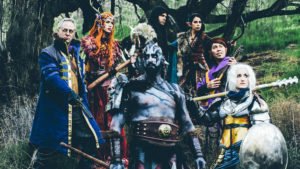 This is no easy feat, lots of very good Actual Plays are entertaining despite notable shortcomings, however Vox Machina managed to create a show that someone who didn’t care at all about traditional Role Playing Games could still enjoy and watch for the entire run. Indeed, many viewers were such people. Vox Machina inspired viewers to create art, short stories, and find community—even if they weren’t interested in Dungeons and Dragons 5th edition or ever playing an RPG. It was exceptional entertainment. Both Player Characters (regular and guest) and Non-Player Characters handled by Matthew Mercer captured the imaginations of viewers, the full scope of human emotion was at play on the table. Second, the healthy table dynamics, players generally modeled self-control, kept good humor, and respected on another. The players each contributed more than simply their class abilities to the play, they each encouraged one another and developed stronger interpersonal bonds with each other because of the game. Yet the table was never an eddy, one didn’t get the idea that it was an insular group of gamers. Guests could come and go and contribute to the furtherance of the narrative. They modeled good table behavior, and it wasn’t uncommon to find reference on Reddit or in their Twitch chat to the demeanor of VM helping people scarred by past experiences return to role playing or improve the behavior at their current gaming table. Thirdly, VM provided an excellent introduction to becoming a tabletop role player. 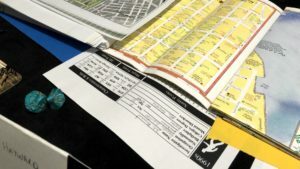 New players could see that the basic component of an RPG is not the Core Rulebook(s), but the moment of play, the fellow players, and the shared unfolding story. Role playing isn’t about knowing lore, but about being a decent human being at the gaming table and pretending to be a character for fun. It isn’t about winning, it is about growing together within a story. As an example to many, Sam Riegel’s character Scanlan Shorthalt goes from being a one dimensional sheet of paper with some stats, a name, and a few ideas, to a hero with more depth than anyone could have imagined at the start of the series. All the characters developed in a similar way, showing a novice player just what can happen with fun, time, love, and narrative. Fourthly, as an example of exceptional DM’ing. Even if one takes a low-prep, no-mini’s approach to GM’ing, Matt Mercer’s preparation and manner are inspiring. 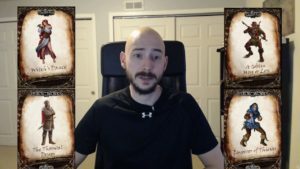 He read his table very well, and knew how to let the players unfold the story without overbearing DM involvement while also knowing when to step in with NPC’s or exposition. This fine balance comes with experience and awareness, and a mindful GM could walk away from many episodes with a masterclass in DM’ing. Matthew’s narrative arcs were centered around characters (PC or NPC), characters drove the story and the conflict—a good lesson for any GM. Critical Role continues, but Vox Machina has completed their heroic journey. More can certainly be said about this expansive role playing actual play, but hopefully enough has been said to send you deeper into their story. Weekly Schedule, Vox Machina now concluded, but Critical Role continues. High-quality production values and sound recording. Occasional table noise, occasional technical difficulties (often due to Skype). Explicit tag in iTunes, but rarely does anything seem out of place or extremely vulgar. Photo from www.geekandsundry.com and all rights reside with the original creator. This Mouse Guard Roleplaying Game Actual Play is full of all the the kind of scale-appropriate adventure you expect in the world of David Petersen’s Mouse Guard: owls, journeys, mail-carrying through the wilds, scent borders, and bees. It integrates the rules very well, sharing tidbits about the Burning Wheel-derived system that mark it as a very different kind of game than D&D 5e. 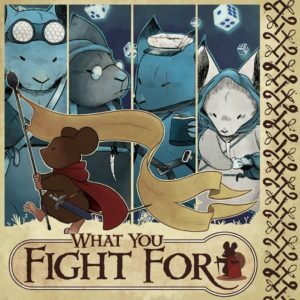 Listeners might benefit from briefly reviewing some of the vocabulary for the Mouse Guard game, as the players are clearly familiar enough with it that they will make passing references to particular mechanics. That being said, you do not need to know the mechanics to enjoy this actual play podcast. As this is a Burning Wheel-derived game, there is some unavoidable crunch. At the conclusion of each session they award Fate and Persona points and deal with Beliefs, Goals, and Instincts. If this system is at all of interest to you, they give a good example of the kind of discussion that closes out Mouse Guard sessions. That is part of the fun of the system (admittedly not fun for everyone!). In addition they offer Cheese Chat, a brief and occasional out-of-character discussion that looks at the player’s experiences with each other, the story, and the system. The table temperament is positive, with good interactions and mutual help in furtherance of the narrative. ~45minute to 1½ hour recording length. Good quality recording, occasional table noise, explicit tag in iTunes, but not distracting. Artwork from wyffcast.libsyn.com and all rights reside with the original creator, Ryan Sigh, check out their page at riansygh.com. Aventurian Adventures brings the world of The Dark Eye to English-language actual play. The players were beginning to gel just as this podcast hit a hiatus, but it is well-worth a watch if you want to see this system underway. John-Matthew DeFoggi GM’s a remote group of players gathered around their own table. He is familiar with the system and helps the other players gain familiarity as it progresses. The Dark Eye, with its diverse skill system, is highlighted as the characters solve problems with more than a sword. Various elements that distinguish this from D&D are clearly noted as the players learn just where this roll-under, European style, crunch-heavy game departs from D&D-informed expectations. I hope this series resumes and doesn’t completely podfade, but it is a valuable edition to the very small The Dark Eye actual play corpus. Some recording issues, some quality issues, some interruptions. Image is a generated by YouTube, and all rights reside with the original creator.